Alice Temperley. English Myths and Legends. Alice Temperley, one of the most accomplished British designers working today, creates clothing that is coveted by the likes of Kate Hudson, Sarah Jessica Parker, Olga Kurylenko, Rita Ora, Poppy Delevingne, Helen Mirren, Adele, Naomie Harris, and The Duchess of Cambridge. This book is conceived as a celebration of Alice Temperley's aesthetic and conveys the effortless decadence and handcrafted allure of her brand. This book highlights the key moments that have inspired the last decade of work?focusing on the personal moments that have shaped her brand. 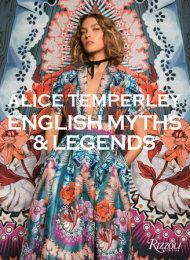 Filled with captivating photographs from Temperley London photo shoots and fashion editorials, ALICE TEMPERLEY: ENGLISH MYTHS AND LEGENDS gives an in-depth look into the inspirations and processes behind the creation of the collections. While her first Rizzoli book, TRUE BRITISH (2011), was a chronological story about the first 10 years of the brand, ENGLISH MYTHS AND LEGENDS gives a more intimate view of what defines Temperley London today and its evolution; revealing both practical and sentimental moments of the designer?s generative history. 2017. 336 S., zahlr. farb. Abb., Text: Engl., Hardcover.